This is a good car except for fuel economy and steering. 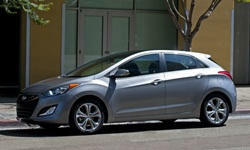 Why the 2013 Hyundai Elantra GT? Acceleration is fine. Do not bother with the -shiftable- automatic. Just leave the transmission in D, it will not accept your input much anyway. We normally leave the car in Eco since we do not drive it like we stole it. Fuel economy is disappointing. We will be signing up for whatever lawsuit will get us the most money from Hyundai. We would much prefer that the car get the mileage that was advertised. With one caveat, the handling is very good for this market segment. That is, a sporty looking economy car. The steering is a bit disconnected, even with the firmest setting. We purchased this car for $18950 out the door in September 2012. For that price, it has excellent features. We bought the blue car, although we would have preferred something darker, like navy blue or midnight blue. The color has grown on us a bit, so we do not wish as much for the other darker blues. Why Not the 2013 Hyundai Elantra GT? This is a fairly quiet vehicle. It is not luxury car quiet, but is good. A comfortable ride. We drove over 500 miles each way on spring break and had no complaints. This is our first Hyundai and we were willing to take a chance primarily due to the warranty. Room enough for up to 6 foot adults. We like the styling. Wagons seem to be out of favor at this time, but these 5 door hatches generally provide more utility than a sedan and look good as well. Did not want a Ford Focus because of past experience with Fords. We thought that the Mazda 3 was a bit smaller and more expensive. We considered most other choices either too odd looking or not fuel efficient enough.